Nearly every business in America is required by the US Government to provide workers with a safe and harmless workplace. 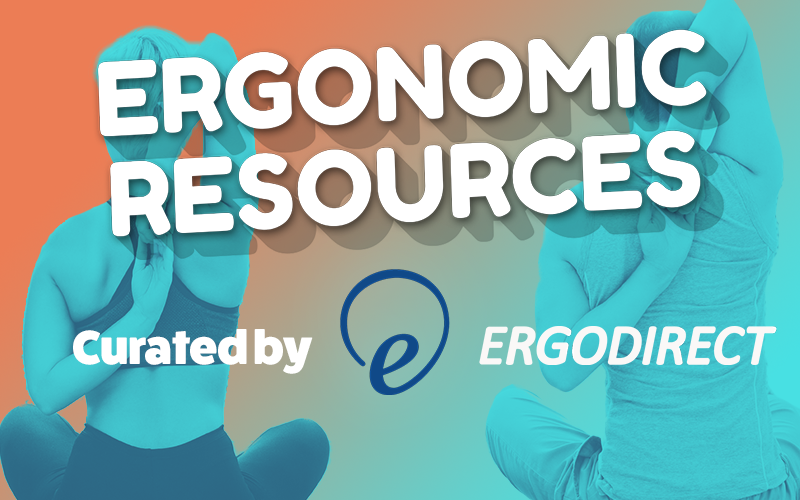 Below, we have linked the best ergonomic resources for you. There are currently 22 states and jurisdictions that have complete state plans covering the private sector as well as state and local government employees. These states include Alaska, Arizona, California, Hawaii, Indiana, Iowa, Kentucky, Maryland, Michigan, Minnesota, Nevada, New Mexico, North Carolina, Oregon, Puerto Rico, South Carolina, Tennessee, Utah, Vermont, Virginia, Washington and Wyoming. In five states/territories—Connecticut, Illinois, New Jersey, New York and the Virgin Islands—only state public employees are covered by health and safety laws. Private employers must still follow federal law. To get more information on state laws and resources visit the U.S. Department of Labor’s website and check out the State Occupational Safety and Health Plans. Fortunately, a great deal of documentation is available to help businesses meet work safety requirements. Many key documents are available online from a variety of federal, state, and university resources. Several key resources are listed below. The goal of JustStand.org is to close the gap in public knowledge about the dangers of excessive sitting and to motivate individuals, businesses and organizations to develop a healthier future. University of California Los Angeles’ Ergonomics department with a ton of resources including office, industrial ergonomic guides, product recommnedations, exercises & stretches, quizzes, and educational information. The Cornell Hand Discomfort Questionnaires (CHDQ) have been developed by Dr. Alan Hedge and ergonomics graduate students at Cornell University. The questionnaires are based on previous published research studies of musculoskeletal discomfort among office workers. The Cornell Musculoskeletal Discomfort Questionnaires (CMDQ) have been developed by Dr. Alan Hedge and ergonomics graduate students at Cornell University. The questionnaires are based on previous published research studies of musculoskeletal discomfort among office workers. The following laptop Specific Cornell Musculoskeletal Discomfort Questionnaires (LS-CMDQ) have been adapted by Hossein Afifehzade-Kashani in Iran. CDC’s Main Ergonomic website – On this page you will find the Musculoskeletal Health Program’s ergonomic recommendations and musculoskeletal health-related research. The Keys to Healthy Computing: A Health and Safety Handbook. Describes musculoskeletal disorders that affect computer operators and includes information on solutions to health problems associated with computer use. This document explains the purpose of alternative keyboards and the difference is between alternative and regular keyboards. It also contains ideas for preventing musculoskeletal injuries. The Association of Safe Patient Handling Professionals, Inc. (ASPHP) is a nonprofit organization that is dedicated to the advancement of the science and practice of safe patient handling. The BCPE provides professional certification for practitioners of human factors/ergonomics (HFE) who demonstrate expertise and comprehensive understanding of the discipline. The Society’s mission is to promote the discovery and exchange of knowledge concerning the characteristics of human beings that are applicable to the design of systems and devices of all kinds. Part I of this document consists of partial or full text of selected NIOSH documents on video display terminals (VDTs). This includes an overview of various occupational health issues, as well as information on topics relevant to VDT use, such as alternative keyboards, rest breaks, and glare. Part II contains a comprehensive bibliography of NIOSH documents on VDTs.